The Ramon Allones Specially Selected is a legendary medium-full Robusto, 4.9” (124mm) long, of 50 ring gauge, and comes in a 50 cigars cabinet. The Ramon Allones Specially Selected is bold but never overwhelming. 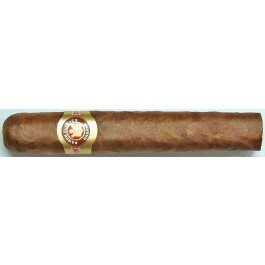 • This robusto is medium in strength and full of flavor and aromas. • Nice deep cocoa taste but this cigar can still be overwhelming towards the end. In summary, the Ramon Allones Specially Selected a great cigar to enjoy after dinner with a digestive. The Ramon Allones Specially Selected is very well presented. It is box pressed and has dark, oily and shiny wrapper with no flaws. The triple cap is rounded and well applied. The cigar is well packed and firm, with the foot being spongier. The pre-light aroma has some cedar tones and sweet tobacco scents. The pre-light draw is sweet, easy and mouth watering. The cigar is nicely rolled with no soft spots. The draw is perfect, and the cigar delivers a thick and rich smoke with a long, spicy finish. The ash is solid, grey in color and stays in the cigar half way down. When it falls off, it reveals a perfectly shaped coal, the burn gets even and stays like that until the end. The cigar starts with some cedar tones with a cracked pepper finish. It quickly gives way to hints of black cherry and honey sweetened coffee with some mild almond undertones that made their appearance after approximately 1 cm. The cigar remains sweet with small hints of salt on the lips for the first third. The best way to describe the sweetness of this cigar would be “creamy sweet” often tasting like a very rich and creamy cappuccino sweetened with a touch of honey. The cigar remains cool, never heating up yielded so much smoke, and tasty creamy smoke at that. The hint of bitter black coffee experienced at the halfway point quickly gives way again to sweet coffee, honey and black cherry flavors with the occasional nutty and very subtle pepper undertones. The final third is absolutely mouthwatering. By then the flavors are blended perfectly. Do not be forced to the nub no matter how much you are enjoying it or it will bite you with heat and bitterness. To summarize; this cigar is full bodied and delicious from foot to cap. To be savored slowly.